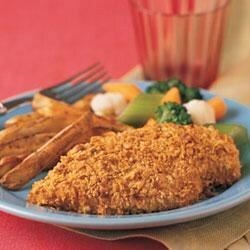 "Chicken is dipped in Swanson® Chicken Stock, coated with seasoned cereal crumbs and baked until crispy and golden." Bake at 400 degrees F for 20 minutes or until the chicken is cooked through. This is good. I doubled the mixture, because I had chicken strips, instead. It worked out well.